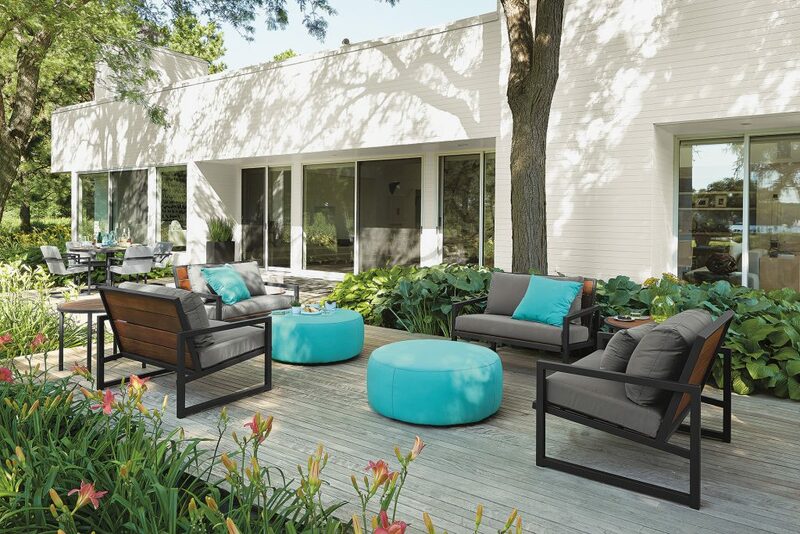 Oasis chairs and ottomans, Solid outdoor pillows and Slim outdoor end table. 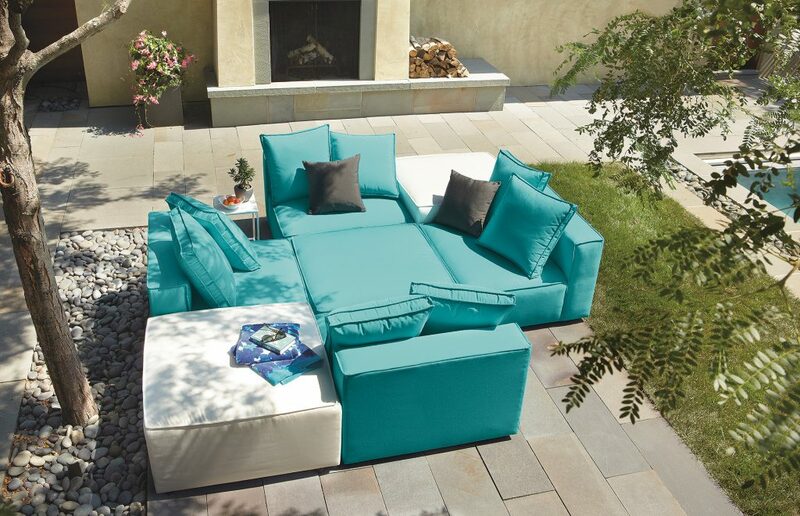 We’re big fans of Sunbrella® outdoor fabric, which you’ll find on all of our outdoor furniture, pillows and umbrellas. This wonder fabric is stain, water and mildew resistant, making it perfect for the patio and really easy to clean. Here’s how. Montego outdoor chairs, end tables and dining table, Finn dining chairs and Boyd ottomans. For light cleaning, rinse the fabric with your garden hose. Brush off any loose dirt and then spray the fabric with your garden hose. If you aren’t able to do this in your outdoor space (like on a balcony), vacuum the fabric with an upholstery attachment to remove dirt and dust. Easy. For spot cleaning, use soap and water. Stains? Not a problem. We like using Folex® spot cleaner, or a mix of 1/4 cup mild soap with a gallon of water. A soft-bristle brush or a sponge will help you lift the stain from the fabric. Once the spot is removed, give it a good rinse because soap residue will attract dirt. For serious cleaning, reach for the bleach. Grab a bucket of the bleach-soap mix and a soft-bristle brush or sponge. Wet the entire surface (to prevent water rings), let the fabric sit for 15 minutes and then scrub. Give the fabric a thorough rinse with the garden hose to remove soap residue, but be careful about getting the cleaning solution with bleach on your plants or grass. A driveway or patio is the best place to clean and rinse. If you don’t want to mess around with a hose or bucket of soapy water, most of our outdoor cushions and pillows have zippered, removable covers that can go in your washing machine. Use the delicate cycle with a normal amount of mild laundry detergent and a cup of bleach. Let the covers air dry. One last pro tip: using outdoor furniture covers will reduce how often you need to clean your furniture which is a win for summer fun. Find more furniture cleaning tips in our care information, and as always, feel free to ask us questions or share your own tips in the comments.